Seeking a professional caregiving position offering on-going training and advancement opportunities. Began caregiving by assisting my Great Grandmother after she began hospice care for her cancer diagnosis. Since becoming a C.N.A., I have cared for seniors with the following conditions or needs: Stroke, Hip Replacement, Alzheimer's Disease, Cancer, Catheter, Diabetes, Feeding Tube, Hospice, Parkinson's Disease. 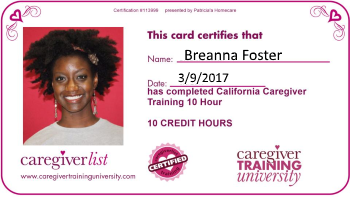 I enjoy providing assistance to seniors and would like to continue to develop my caregiving skills by providing one-on-one care as a professional caregiver. Assisted senior clients with Activities of Daily Living. Cared for 93-year-old lady for 4 years and filled in as substitute caregiver for other assignments, with specialty in hospice care. Assisted with personal care, meals, housekeeping, medication reminders, grocery shopping, escorted to doctor's appointments and engaged in daily activities, including organizing mail, managing appointments, reading newspaper and exercising. Certified Nursing Aide on surgery recovery unit of busy urban hospital. Assisted patients with bathing, dressing, meals and medications. Maintained patient records, updated R.N. on duty and assisted patients with preparation and recovery for additional hospital tests and services and prepared for discharge. Provided waitress service to customers of 100-top full-service restaurant serving breakfast, lunch and dinner. Worked as part of team to keep meals on time for high table turnover. Babysat for 3 children of neighbor family during summers, school breaks and as needed. Completed C.N.A. Training program, including field work at Mid-town Nursing Home. Successfully passed state exam upon completion of course.